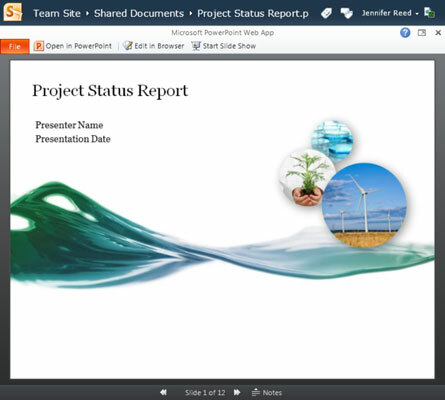 As a default, the PowerPoint Web App opens files in Reading View and runs animations and transitions that are embedded on the slide. Immediately after the file is loaded on the web app, you have access to commands that allow you to access the File menu, open the file in the PowerPoint desktop application, edit the file on the browser, or start a slide show. When you click the Edit in Browser command, you are taken to the Home tab on the Ribbon. You see some familiar editing buttons and icons that enable you to format text and paragraphs, navigate and manipulate slides, and access the cut, copy, and paste icons. Editing the file in the rich desktop application is a one-click action from the Home tab with the Open in PowerPoint icon. Thumbnails of your slides are displayed on the left. You can jump from one slide to another by clicking the thumbnail, change the order by dragging and dropping the thumbnails, and duplicate or hide slides by selecting them and clicking the appropriate icon on the Ribbon. Inserting pictures, SmartArt graphics, and links are done in the Insert tab as you would in the desktop application. The web app user interface does not have as many buttons in the Insert tab as in the desktop application. 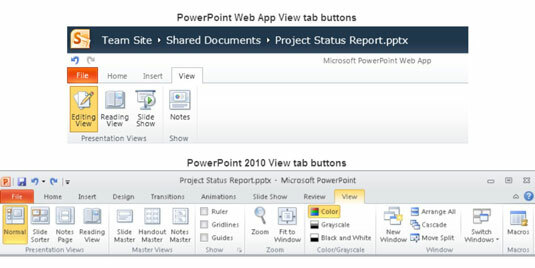 The View tab in PowerPoint Web App displays only four buttons: Editing View, Reading View, Slide Show, and Notes. Clicking the Notes icon will toggle the display of your slide notes on and off.